Fabiano Caruana got back to 50 percent today at the Grand Prix in Tashkent as Boris Gelfand blundered a double attack. Sergey Karjakin bounced back after two losses, and beat Anish Giri. That is still possible for the world number two after Gelfand kind of helped him to get to 50 percent today. GM Dejan Bojkov analyzes what was a Nimzo-Indian where Black was fairly comfortable out of the opening. But then “it went from completely unclear to me slightly pressing,” said Caruana. The game was still clearly within the drawing margin when Gelfand overlooked a double attack: “I thought it was a clear draw, then I couldn't find anything clear and then I blundered,” he said. Caruana and Gelfand, the two winners of the previous Grand Prix. | Photo © Yulia Monakova courtesy of FIDE. Giri was still fairly cheerful at the press conference despite the fact that he lost a pretty bad game. In a sideline of the Sicilian Taimanov, the Dutchman erred as early at move 10 and was lucky that he didn't become the victim of a miniature! Can you see why 13.Nxb5 is so strong? The way Karjakin played it gave Black a chance to get back into the game, and suddenly things looked bright again from a strategic point of view: Black had the bishop pair, and e5 was weak. This got Giri to overestimate his position, and soon his king came under a second wave of attack. Not a great game by Giri; Karjakin now back to 50 percent. | Photo © Yulia Monakova courtesy of FIDE. Jobava has played fairly solid openings so far, but what he did against Vachier-Lagrave today was far from solid. After just 12 moves in an Advance Caro-Kann, he was forced to give up a piece, but as so often his creativity saved the day. Or maybe it was simply the fact that MVL isn't in top shape — the French GM was quite disappointed: “It's a pity I couldn't finish it off,” MVL said. Another wild game between Vachier-Lagrave and Jobava. | Photo © Yulia Monakova courtesy of FIDE. Kasimdzhanov-Nakamura, however, was a fairly good game by both players. Nakamura said he went for the Dutch because his opponent wasn't in great shape, but in this game the Uzbek GM was the one who had chances for an advantage — even in the final position! A correct GM draw between Kasimdzhanov and Nakamura. | Photo © Yulia Monakova courtesy of FIDE. Nakamura kept his shared first place in the standings because Andreikin had drawn his game before him, against Jakovenko. In fact, the Russian followed Nakamura's recipe in the well-known QGD line that was also seen in Gelfand-Jakovenko (as Black!) earlier in this tournament: putting the bishop on f6. A draw in Jakovenko-Andreikin. | Photo © Yulia Monakova courtesy of FIDE. The draw between Mamedyarov and Radjabov was the quickest, and the easiest to predict. It seems like these players have made a pact for life to stay friendly in all their mutual games! Another very quick draw between Radjabov and Mamedyarov. | Photo © Yulia Monakova courtesy of FIDE. 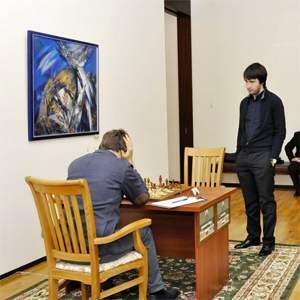 Round 2: Vachier-Lagrave Moves to 2/2 in Tashkent; Did Caruana Miss a Win?